To ensure that I'm having a healthy and cheap lunch during the week, I always make my own salad to take in to work. However, as you can imagine, eating the same thing every day can get a little boring and with the cold weather my body does sometimes crave something a little more filling. 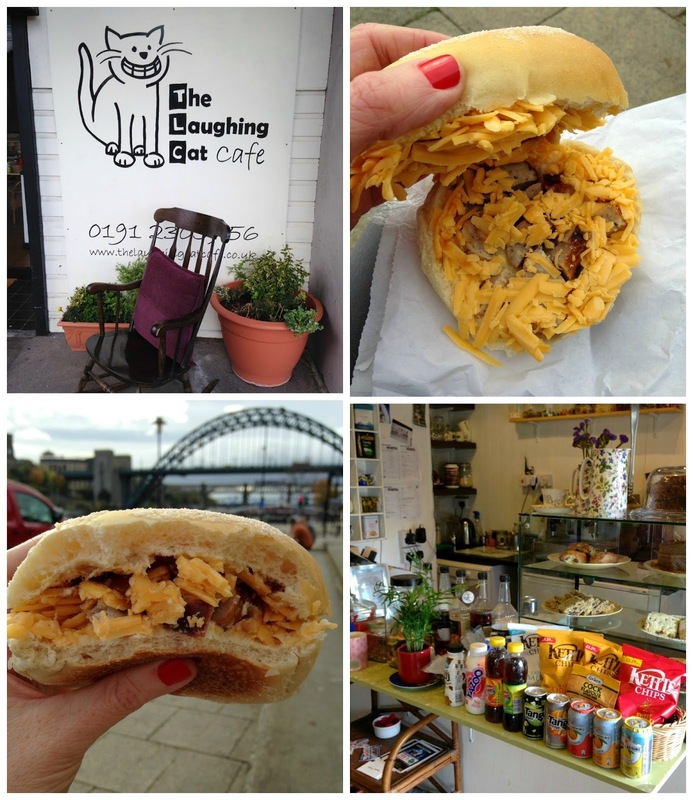 So recently I decided that every now and again I'd treat myself and head into Newcastle to try out a few independent sandwich shops so I could share with you some of the best places to grab lunch on the go. I'm not denying for a moment that I don't love a Greggs sausage roll but I do struggle to understand why people would want to buy the same sandwich from the same predictable chain every day. There are so many fantastic alternatives in the city and it's great to support the local businesses that make Newcastle extra special. The Laughing Cat is conveniently located just off Newcastle's main shopping area, Northumberland Street. Hidden beside the Library and Cruise it's a bit of a secret gem, giving you the benefit of not having to wait in a massive queue when you need to grab a quick lunch. For those with a bit more time on their hands, the little café has a number of tables in a homely and relaxed environment. Even arriving during my lunch hour there were seats available so it's a great place to head. The food is homemade and the menu offers a wide variety of sandwiches, jacket potatoes and salads as well as a few rather delicious looking cakes. I was tempted by a number of sandwiches on the menu before opting for Sausage, Cheddar and Garlic Pickle served on a white roll. My lunch was made to order so I was offered a seat whilst waiting a short while for my sandwich. As it was a nice day, I took my lunch for a stroll down to the Quayside to enjoy the Winter sunshine. The roll was quite small but it was stuffed with filling, so much so that when I unwrapped it I was desperately trying to catch precious flakes of cheese (there's no way I was letting any yummy food miss my mouth!) My lunch was delicious, I really enjoyed the flavour provided by the extra kick of the garlic pickle. Positioned on the beautiful Grey Street, Good Times Sandwich has been open for just over a year. Despite having their menu stashed in my desk drawer at work since opening it has taken me this long to visit. Shame on me! Offering an immense selection of fillings, Tommy and his team serve up pretty much anything you like in a sandwich as well as freshly made soups and hot filled stotties at breakfast time - all at very reasonable prices. On my visit I had a jacket potato with cheese and beans and I was so impressed with the service I received. I was asked what size potato I'd like and whether I'd like the cheese or beans on first. It's this attention to the small things that makes GTS such a great place to visit. I ate at one of the few seats provided and enjoyed listening to the happy buzz in the shop. The place was busy, the service was fast and the banter was great. GTS have a lot of regular customers which speaks volumes. 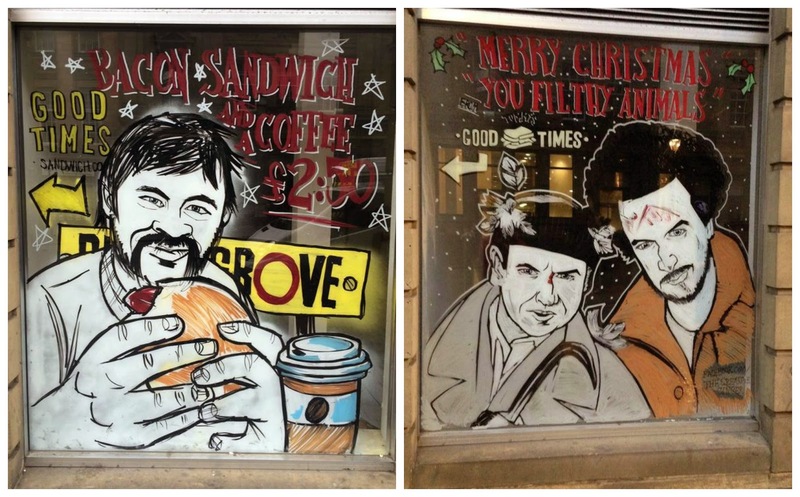 They also have the most eye catching window in Newcastle, with a festive tribute to Home Alone over the Christmas period and more recently a homage to Geoff from Byker Grove. Located equal distance between the Quayside and the centre of Toon, Made Deli is very popular. With a constant stream of customers filling the little shop this is somewhere where it definitely pays to arrive before the rush or pre order. Pre ordering at the deli couldn't be easier and you can order your sandwich from the comfort of your desk via the website so it's ready for you to collect at lunchtime. The "Order Online" section of the website is clearly set out and so easy to use with a tick box list to create your favourite lunch. The deli is small but a lovely space with colourful shelves and wallpaper and beautiful blackboards full of food choices all written in coloured chalk. There is a small seating area with 4 chairs so be quick if you want to park your bum. The selections of bread, fillings, sauces and extras is pretty overwhelming but I loved the "Sandwich Combinations" blackboard that gave great inspiration. I chose my stottie off the board and went for a Goats Cheese, Beetroot and Onion Marmalade. It was huge, stuffed full and very satisfying. 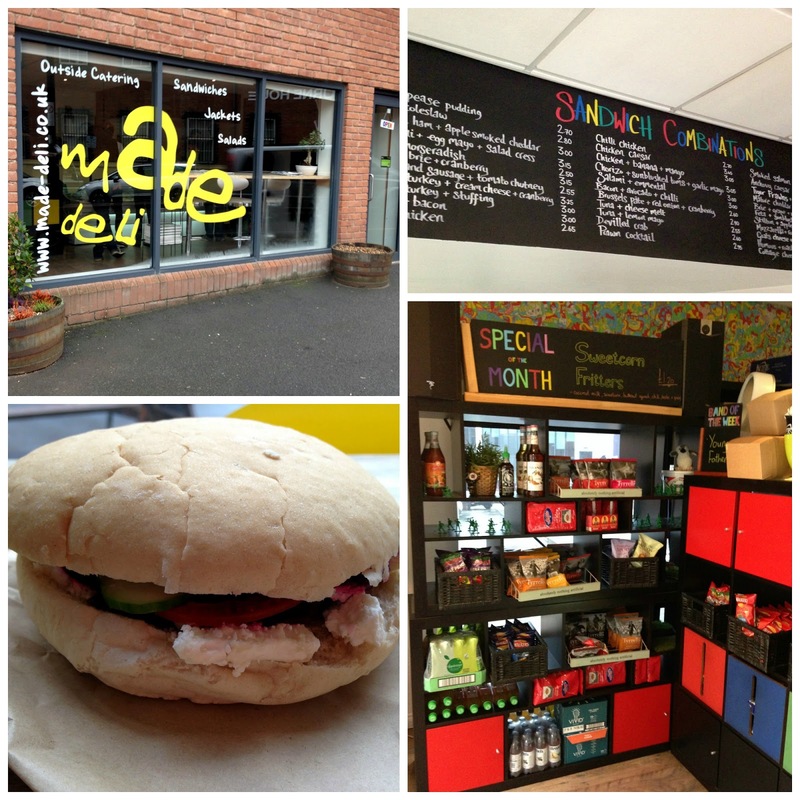 Made Deli offers great value for money, a huge choice of fillings and delicious food. 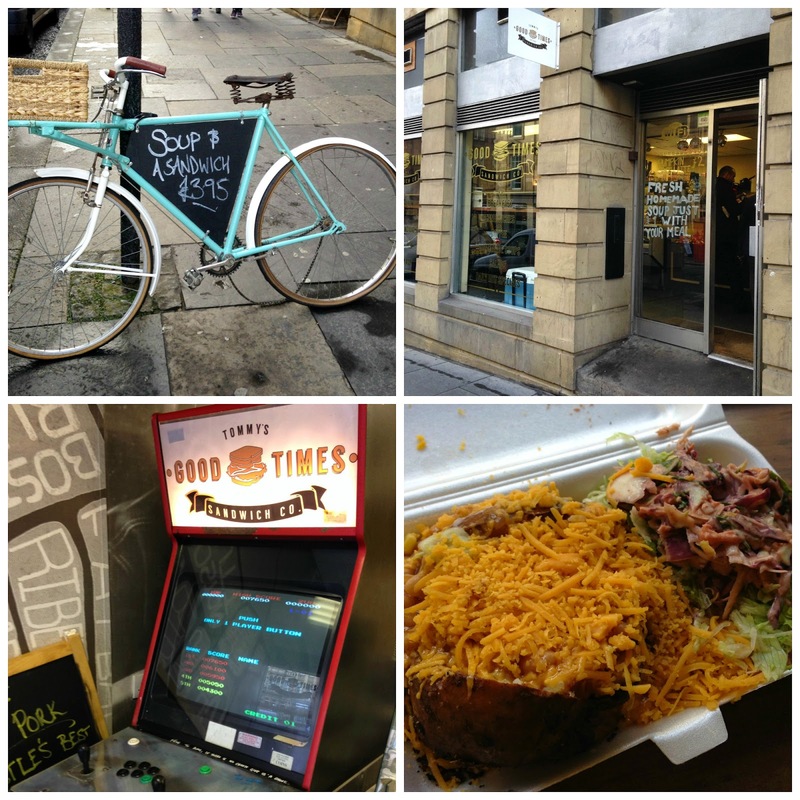 Finding Love Lunch can be a bit of a mission, a stone's throw away from the Life Centre in Newcastle it's hidden down a little side street next to a storage unit so definitely a "word of mouth" deli. I found it with no problem after a good study of Google maps. I hiked from the Quayside which was mostly uphill so I was hoping Love Lunch would be worth the walk. As I burst through the doors, announcing my arrival and explaining my journey I couldn't have been made to feel more welcome. Dani and her team are passionate about the food they serve and were enthusiastic in explaining their lunch options to me, in all honesty I could have stood about chatting all day! 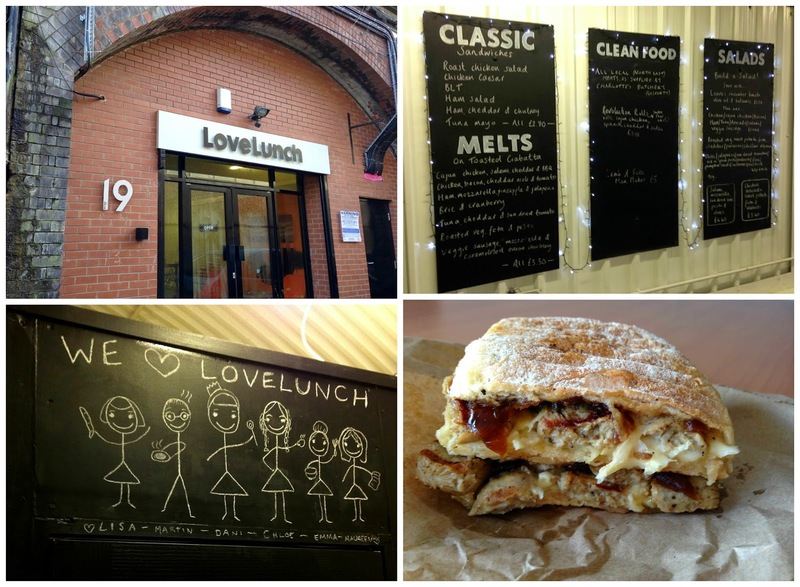 Love Lunch is one of a few establishments in Newcastle offering "clean" lunch options with gluten free dishes, low carb bread and yummy treats made with natural ingredients rather than processed sugar. The small display of cakes were especially impressive and I loved the sound of the cookies made from chickpeas, honey, dark chocolate and nuts. Unfortunately being allergic to nuts it was a no go for me but I'm hopeful someone will give them a try and let me know how they are! Lunch was a choice of sandwiches, freshly made salads, melts or a rather scrummy looking hot dish that Dani produced from the oven to show me. I opted for a Vegetarian Sausage, Mozzarella and Caramelised Onion melt which was made freshly as I waited. Their menu changes daily so make sure you give them a follow on Facebook to see what's cooking at the Deli - if you're lucky you may stumble across a day when there's pancakes, brownies or scotch eggs on the menu. My lunch was beyond delicious, I savoured every mouthful and was gutted when it was over, and to think that my melt was a darn sight better for me than a shop bought processed and packaged sandwich made me grin from ear to ear. There is no doubt that it was worth the walk and I will be back! I'd love to hear what you have when you fancy something special at lunchtime, and if anyone in Newcastle has recommendations of other local sandwich shops and delis I should try please do let me know.